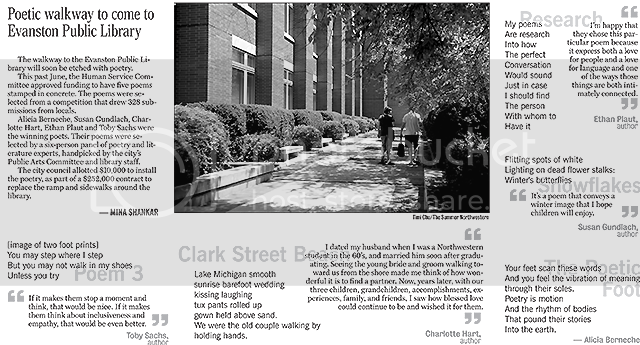 The walkway to the Evanston Public Library will soon be etched with poetry. This past June, the Human Service Committee approved funding to have five poems stamped in concrete. The poems were selected from a competition that drew 328 submissions from locals. Alicia Berneche, Susan Gundlach, Charlotte Hart, Ethan Plaut and Toby Sachs were the winning poets. Their poems were selected by a six-person panel of poetry and literature experts, handpicked by the city’s Public Arts Committee and library staff. The city council allotted $10,000 to install the poetry, as part of a $252,000 contract to replace the ramp and sidewalks around the library.